Transient Canvas (clarinetist Amy Advocat and marimbist Matt Sharrock) performs at the Original Gravity Concert Series Wednesday. SOMERVILLE — The musicians set up to the left of the bar, among the beer barrels and brewing tanks. People milled around, some clearly part of a loose coalition of composers and performers, others just having a beer at the end of another cold, snow-battered day. 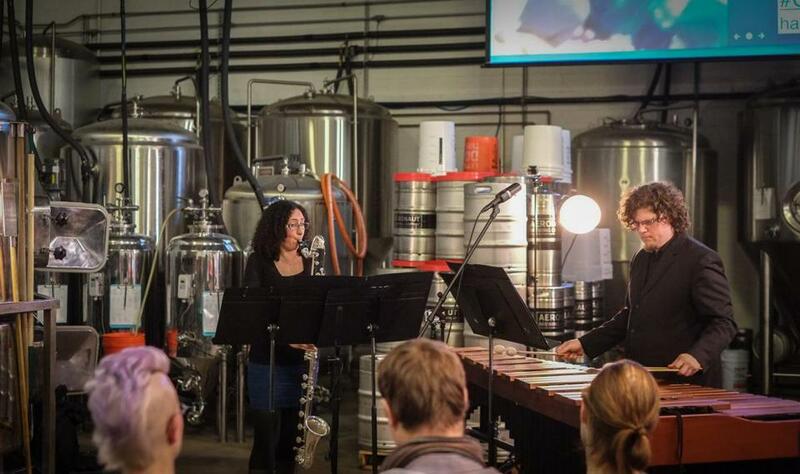 This was the scene on Wednesday at Aeronaut Brewing Co., which was hosting the third concert of the Original Gravity Concert Series. Curated by composer Keith Kirchoff, the series is another endeavor to get classical music out of concert halls and into a more casual setting. Original Gravity works a variation on this now-familiar theme by pairing each concert with a specially crafted Aeronaut brew. Wednesday’s concert brought together five works by New England composers for bass clarinet and marimba, played by the superb duo Transient Canvas (clarinetist Amy Advocat and marimbist Matt Sharrock.) The beer was a bourbon-flavored Jackdaw porter. Dark and nutty, with hints of caramel and coffee, the beer matched well with the deep-voiced textures created by the two instruments. The concert had the laid-back, come-on-in vibe that makes events like this worth producing. Of course, there can be too much of a good thing: Before the premiere of Beau Kenyon’s “to look at you and dance and smile, to listen to you sing and then laugh,” Sharrock politely asked the audience to “keep the murmuring down” so that the fragile, skeletal sounds of the piece could materialize. Compliance with his request seemed minimal. Most of the time, though, there was a natural, unforced attentiveness among the crowd very different from that in a traditional concert hall. Andrew Paul Jackson’s “Aphorism 9” began with the two instruments echoing phrases off each other before settling into an interlocking rhythmic groove reminiscent of classic minimalism, though there was an arrestingly slow episode not long before the end. Kirchoff’s own “Monochrome,” also a premiere, had the most dissonant harmonies and aggressive rhythms of the evening, though it too wandered into ghostlier terrain. They were all involving, well-crafted works, played with great confidence by Adovcat and Sharrock. The music also felt at home in this setting, one with a few kinks but definitely worth preserving. Original Gravity’s final concert of its first season is May 27.